We’re pleased to introduce sections to help you parse what’s going on. [Kenya] Citizens in Kenya and around the world are unifying around the hashtags #WeAreOne, #AriseKenya, #PrayForKenya and others in the wake of the tragic #WestGateAttack. We’ll have more thorough coverage soon. [Greece] YouTube videos of Greek citizens throwing yogurt at their leaders. A form of (literal!) culture jamming. This piece from Scientific American explores the deeper social/political context from which this practice arises. [Religion] Sharing our sins on social media. A synagogue in the US implements social media into their services. Reminds us of the Pope’s offering of indulgences via Twitter during World Youth Day in Brazil. [Saudi Arabi] Global Voices shares a meme popping up in which Saudi boys and young men are sharing photos of their painted nails on Instagram and Twitter: “The boys are poking fun at girls sharing their pictures on social media – of the shoes they wear, nail polish they apply, the coffee they sip and gifts they exchange with each other.” Does this remind you of something? In the US, young men have been turning their gym shorts into cocktail dresses. [China] Which emotion spreads fastest on Chinese social media? Anger, especially about conflicts between China and other countries and internal social problems. Sentiment analysis was conducted by looking at the emoticons netizens used in their messages. [Mexico] We’ve been following #InformeMancera, a hashtag meme about Miguel Mancera who is an economist in Mexico. Do any of our Spanish-speaking readers, especially those with toes to Mexico, have insight into this hashtag? [Islam] Many thanks to @ zeynep for pointing out #MuslimRageMovies, a metameme of #MuslimRage, with joke movie titles that mix pop culture and references to Islamic traditions. With classic hits like I Know What You Did Last Ramadan and Fifty Sheikhs of Grey. It quickly trended this past Monday. Not everyone was pleased, however. Do any of our readers have insight into this hashtag and how it arose? 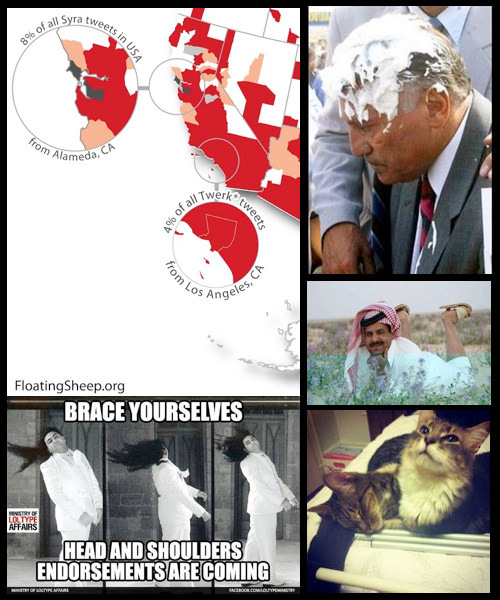 [USA/Syria] Researchers at academic research group Floating Sheep develop a Twerkyria Index to determine regional differences in tweeting about twerking vs. Syria. Most of the country tweeted more about twerking, but some, like the South, tweeted especially more often about twerking. In Washington, D.C., Syria was tweeted nearly 4 times more often than twerking. [Internet History] Blogger Steve Portigal points us to a 2002 article on the rise of Photoshopping as a mode of expression: “It’s called photoshopping, and it’s the digital generation’s version of painting a mustache and glasses on the Mona Lisa. With their computers, photoshoppers digitally manipulate pictures. They cut, crop and blend images into existing photographs to make jokes or social commentary. And the Web’s newest, puckish subculture is burning across the world.” Amazing stuff! [Internet History] Know Your Meme co-founder Kenyatta Cheese recently gave a talk on the history of animated GIFs… in the form of a fairytale. His talk is online, and he’s made a Tumblr to share the tale with all. [Media] Congrats to Upworthy and Tea Leaf Nation for their recent financial successes. They’re showing that digital-first storytelling and a focus on social media content can have a real impact in journalism. [Global] The Ig Nobel awards were recently announced. They honor scientific achievements “that first make people LAUGH then make them THINK.” The peace prize went to the President of Belarus, who’s made it illegal to applaud in public. [USA] Former The Onion funny guy and now founder of humor/tech consultancy Cultivated Wit, Baratunde Thurston speaks with The Verge about the importance of humor and Twitter in this day and age. Thurston hosted a Comedy Hack Day at MIT this weekend. [Reddit] When frustrated males get together, gripe and share tips on picking up women. Business Insider takes a dive into the Reddit community of anti-feminists, 15,000 strong. [Gaming] Selfies finally make their way into videogames, namely Grand Theft Auto V and Zelda: Wind Waker. In Wind Waker your selfie (of Link) will wash up in a bottle in someone else’s game. [Pakistan] The Civic Beat correspondent Irteza Ubaid reminds us that Sept 17 is the one-year anniversary of Pakistan’s ban on YouTube. But there’s evidence that youth are finding workarounds, like the series of memes on YouTube for the Eye to Eye video. [China] Tea Leaf Nation’s Liz Carter explores the crackdown on “rumors” on Sina Weibo. Quartz offers a short profile on Fu Zhenghua, the police officer in Beijing leading much of it. Harvard professor Gary King launches a fake social network in China to get a glimpse into the wide variety of tools and services to actively control the web. [Iran] Iranians got a glimpse of Facebook and Twitter access in the country, only to see both sites blocked again a day later. Authorities attributed it to a “technical glitch”.